The weather may be all over the map these days, but if you’re anything like me, you feel a spring in your step put there by the promise of the pleasant days and nights to come. Spring is a season, like all of them really, of change. It is a time to reinvent yourself and tackle things with renewed energy. Hence the inexplicable urge to sweep out the cave. The advent of spring cleaning is upon us. I hope that you are well on your way to building your perfect wardrobe by process of attrition, retention and fabrication. You may have fewer clothes now and they deserve the best treatment that you can give them. Treatment that includes regular brushing, mending, room to breathe in the closet and the right hanger on which to refresh them. Up to now you have probably relied on the hangers that come with your suits, some are better than others to be sure, and the wire things that your trousers and shirts return with from the laundry. You may have heeded advice that says to buy matching wooden hangers for an instant closet upgrade. It is very refreshing to look upon clothes so elegantly arranged. Shopping your closet has never been so enjoyable. But if you want to take that feeling to the next level, if you want your clothes to look like a million bucks, there is only one real choice to make. Hangers from Kirby Allison’s Hanger Project. Especially if you’re hanging bespoke or MTM suits, sportscoats, trousers and shirts. The best defense against wrinkles and a shorter life span for your clothing is a good offense. You see, Mr. Allison was a man obsessed. We can relate, can’t we? He couldn’t find a decent hanger for his suits. So he decided to have them made. Which he did about two and a half years ago; but only after consulting with tailors, cleaners and men of style. And that is why Kirby Allison’s Hanger Project produces the most functional and the most beautiful hangers available to the public. 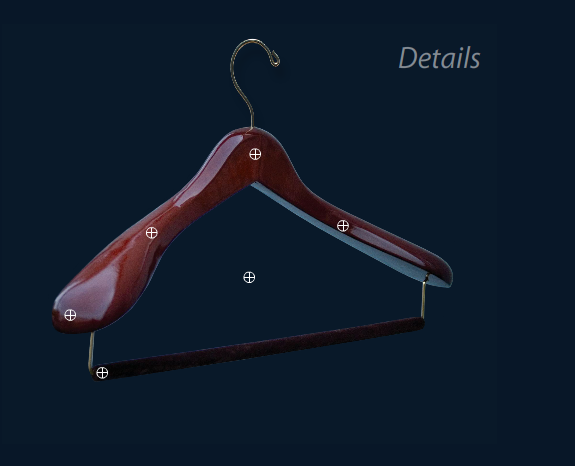 Luxury hangers? In this economy? Absolutely, you’ve made an investment in your clothes and you know from personal experience that one size does not fit all. That’s why Mr. Allison’s suit hangers come in three different widths with the widest shoulder flare on the market (five times the average, apparently!) Neither does he neglect shirt hangers. Narrow and skinny shirt hangers are what cause dimpling. Unless your shirt hanger is sized correctly for your shirts. Trouser creases are formed when the trousers shift around on hangers. Unless your trouser hangers are felted to prevent this from ever happening. Of course, you are an environmentally responsible consumer and value sustainability and craftsmanship (all those tailors that you support.) You will, therefore, be relieved to learn that all of the Hanger Project’s hangers are constructed from premium maple wood responsibly forested right here in the United States. That caught your attention didn’t it? “Premium maple wood… ” Because, let’s face it, we are obsessed with being surrounded at all times by the most beautiful things that we can find. I’m halfway resolved to tossing out all but those articles of clothing that now rest on Mr. Allison’s superb product. After all, fewer of these pieces of domestic art (hangers doesn’t really do them justice) will fit side by side (ah, the price of beauty.) Which should make spring cleaning even more effective than usual. This entry was posted in Living and tagged Joan Crawford, Kirby Allison's Hanger Project, Luxury Suit Hangers, Mommy Dearest, Spring Cleaning. Bookmark the permalink. I second this post. I’ve ordered twice from the Hanger Project and have been pleased. The quality is great and my suits seem much happier. I’ll need to order more when I rotate the wardrobe soon. They have gift sets available that offer suit, trouser and hanger combos that can be had for less than a quality tie. My opinion is obviously very biased. I’ll acknowledge this first. However (only because this is something I care about), everyone understands they need shoe trees… but so few comprehend that they need suit hangers even more. Using the free hanger that comes with most suits would be like using the tissue paper that came stuffed at the bottom of your shoe in lieu of a proper shoe tree. Absurd. Great garments need excellent hangers. You might as well buy one that’ll last a lifetime. As a gift from Kirby Allison’s Hanger Project, please enjoy FREE SHIPPING with the promotional code “GoogleKnol” on orders placed before the end of March. Paul Stuart sells nice wooden hangars in two different styles. After we had the downstairs freshly painted, including the interior of the closets, I ousted all of the junky plastic, wire, and freebies I had accumulated in there and purchased a couple of sets of their lovely wooden hangars. They have a better sound, too, when being pushed along the closet pole, and they feel better in the hand. They are a quietly elegant home accessory that maybe no one will notice but you. In Paris, one can find these readily in the basement of the BHV!